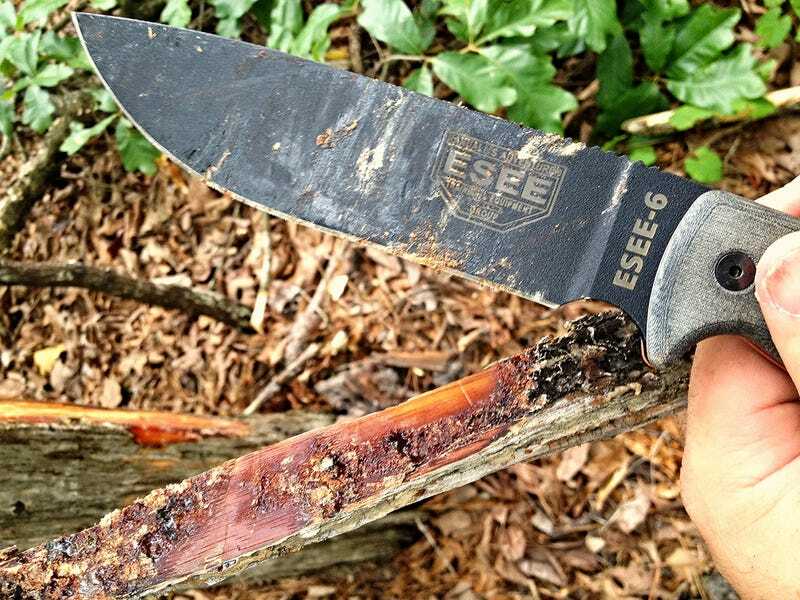 Reader Loran Richardson just received the ESEE-6 survival knife he won in our reader giveaway. How's he using it? Once again thank you for your generous give way. I am so grateful to be the winner. The ESEE-6 is an awesome knife. I have been a big ESEE fan for a years and own a couple already. I took the 6 out last weekend and proceeded to do just what you are supposed to do with an ESEE: beat the crap out of it. I used it to break down some fatwood stumps, as well as clear branches for my trail camera. I chopped with it, used it to baton into super hard stumps and even used an ESEE fire kit to practice a little fire making. I had only polished the factory edge on a leather strop before taking it to the woods and it was scary sharp, once home and cleaned up it only took a couple of minutes on the strop and it was sharper then it started. This steel is amazing. Its got a couple of marks on it now, but I like the looks of a dirty knife that's being used more than a new one anyway. Its going to be my woods companion, strapped onto my backpack as I spend a lot of time in the woods, hiking, hunting, scouting, and enjoying nature.